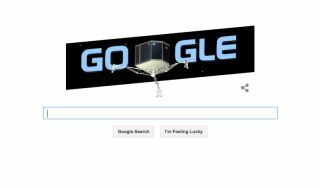 Google website presented a "Google Doodle" honoring ESA's Philae lander on Nov. 12, 2014, the day it descended from Rosetta spacecraft to land on Comet 67P. Scientists and space fans aren't the only ones excited by the unprecedented comet landing performed today (Nov. 12) by the European Space Agency. The folks behind Google's whimsical doodles are joining the celebration, too. Today's epic comet landing marked a major first for space exploration: the first controlled, soft-landing on a comet in history. ESA launched the Rosetta mission in 2004 and the two probes spent 10 years chasing Comet 67P/C-G across the solar system. They traveled 4 billion miles to reach the comet, and arrived in orbit around the icy wanderer earlier this year, in August. After a month and a half scouting for landing sites, ESA scientists picked a target on the head of the duck-shaped Comet 67P/C-G. Philae will ride the comet while Rosetta shadows both from orbit through at least March 2015. The mission is designed to study how the comet changes over time, and researchers hope to learn more about what Comet 67P/C-G is made of and how it has evolved. Since comets are thought to be the cosmic leftovers from the birth of our solar system, the Rosetta mission could give scientists their most detailed glimpse yet at the raw materials that led to the sun, Earth and other planets.